'Grano Violetto' is a unique and colourful early maturing broad bean from Italy, a heritage variety with excellent flavour. It is a very hardy variety that handles frost well and is suitable for sowing from October to November or February to March. The plants grow 80 to 90cm (30 to 35in) tall and are highly productive even at the lower parts of the plant. 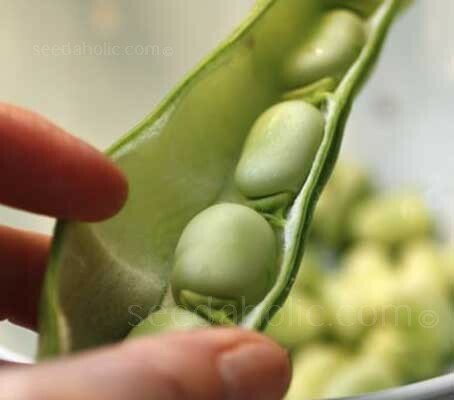 The pods are typically 22 to 24cm (8 to 9in) in length, with six to eight beans per pod. The dried seed is violet in colour, while the fresh seed is green. The plants are most often harvested when they first reach full size while the beans are still in the green shell stage but before the skins start to toughen. At this time the pod will still be quite soft and the seed will not be much bigger than a penny. Gathered at this time, the seeds are tender and delicious. Sweet and mild they lack that strong taste that larger broads can take on. Broad beans are best suited to a cool climate, and they only grow satisfactorily at temperatures below 15°C (60°F). If sowing in the autumn, choose a sheltered position. The ideal soil is one which has been manured for a previous crop. Broad beans are traditionally sow in double rows 7cm (2in.) deep, 23cm (9in.) apart in the row. The double rows should be spaced 23cm (9in.) apart and a distance of 40 to 60cm (18 to 24in.) should be left before the next set of double rows. Plant seed 5cm deep. They should be planted or thinned to 20cm apart in staggered rows 30cm apart. Sow extra seeds at the end of the row for transplants. As the beans get taller, you will need to provide extra support to your plants. A common mistake of the first-time gardener is not giving plants support ties that allow growing space. The haulm (stalk) of the broad bean plant is very brittle and easily broken, so the best way to support the plant is to construct a narrow box of stakes pegged in at 120cm intervals. Twist lengths of string from stake to stake to create a supporting frame that the bean plants can lean against when being blown around by the winter winds. Further levels of string can be added as the beans grow taller. Once the pods start to form, ensure the beans are well watered around the base of the plant during dry periods. If the plants send out side shoots from the base, these should be cut off. At the end of cropping the plants should be removed from the soil. If the plants are left in the ground after their work is done, young sucker shoots can emerge which will exhaust the soil for follow-on crops. One of the gardening formalities with broad beans - undertaken when the flowers have just wilted to black, sooty curls and the first tiny pods are about to appear in their place - is to pinch out the little cluster of leaves at the top of the plant. This arrests further growth, directing the energy of the plant into the developing pods. Don't discard these leafy bean tops - stir-fried in butter until lightly wilted, they are a delicious vegetable side dish in their own right - think of them as beany greens. They are also a fine filling for a tart or omelette. Harvest 8 to 10 weeks from spring sowing. Regular picking (ideally 2 or 3 times a week) will keep production going for about 4 to 6 weeks For the best flavour, pick the beans when they are starting to show through the pod while the scar on the end of the beans is still white or green (although they can still be enjoyed after the scar has turned black). To remove the pods from the plant, give them a sharp twist in a downward direction. With the last pick of the summer, the fat, bulging pods need a good 10 minutes boiling, after which the tender green kernels can be slipped out of their pale, leathery skins. Fava beans or Horse Beans. If sowing in the autumn, choose a sheltered position. The ideal soil is one which has been manured for a previous crop. Harvest 8 to 10 weeks from spring sowing.